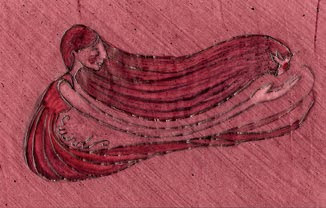 This ecollustration is not done with carmine watercolor, or ink and neither acrylic, but with "Tlapanochestli." Which stands for Cochineal in Nahualt(an aztec dialect). Cochineal is parasite insect of the "Nopal". The Cochineal produces a natural red coloring known as carminic acid. 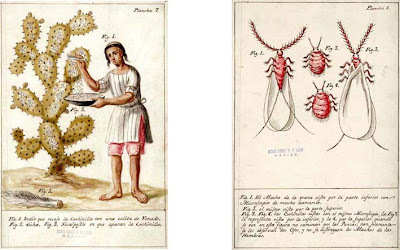 I was first introduced to this parasite, when my elementary school in Oaxaca, took us in a field trip to the Cochineal farm, also known as the "El Centro de Difusion de Conocimiento de la Grana Cochinilla y Colorantes Naturales". It was fascinating and I'm still fascinated by it. It is one of nature's gift and is free, talk about actual giving. Thanks to these cochineal it can be used to dye fabrics, for make up, ink and even food coloring. I tried painting with the cochineal in watercolor paper but the paper sucked in all the pigment leaving the paint in black and white. When I tried with transfer paper, the result is the ecollustration you are looking at, which is the element of air helping a humming bird take off. "THE BEST KEPT SECRET IN OAXACA: GRANA COCHINILLA"